It’s All Greek… | Jake & Sam -- Let's Cook! When I spent a summer on a Greek island almost fifty years ago, there was a great deal of excitement one day when one of the locals caught a big fish. It wasn’t seriously large like a swordfish or marlin, more like a 5 pound Mediterranean sea bass. But it was still cause for celebration because in those days there weren’t many fish in that part of the Med that weighed more than a few ounces, except of course for octopus. A party was planned to cook the fish and fortunately I was invited. It was there that I first heard the melodious term “Psari Plaki” (SAR-ee PLA-kee) – psari being Greek for fish and plaki meaning something like “laid flat.” A fire was lit, and a large pan produced. 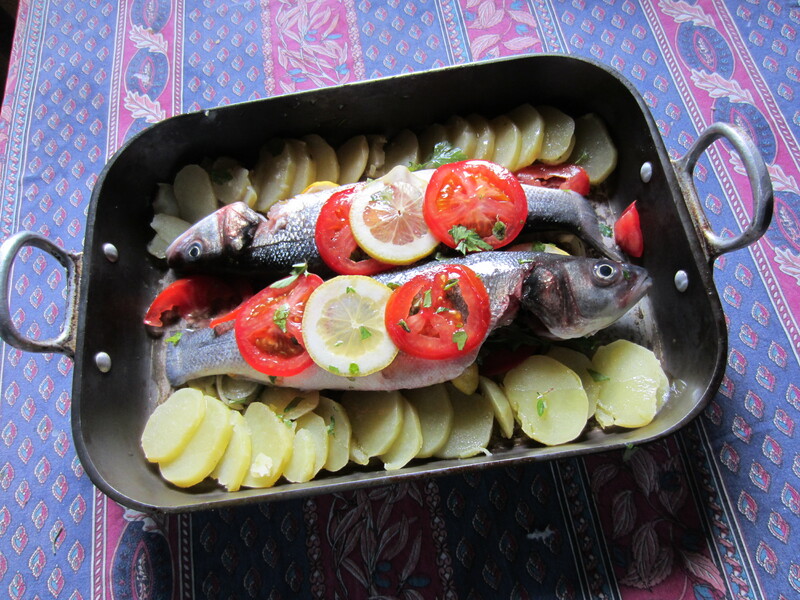 The fish, after being cleaned and scaled, was laid flat in the pan on a bed of tomatoes and onions and herbs and garlic, decorated with lemon and tomato slices and annointed with olive oil. 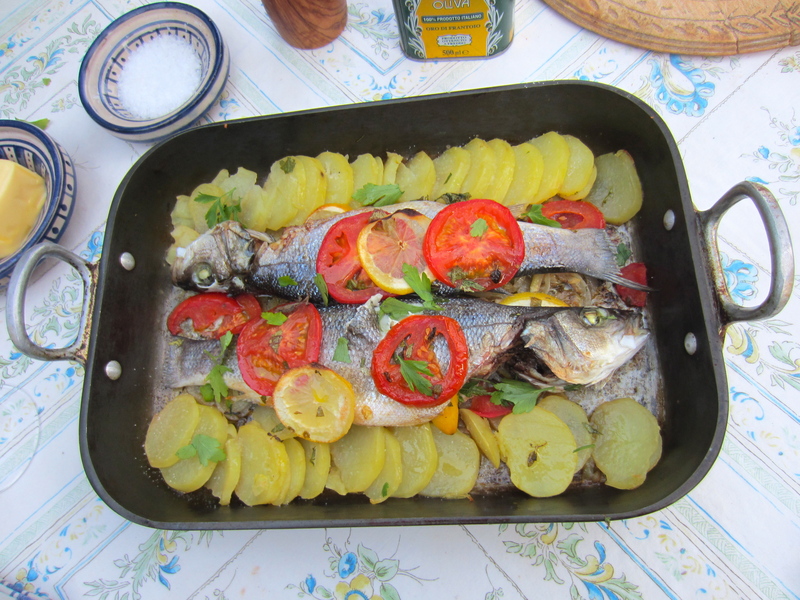 It was then covered and baked on the fire for about an hour: The marvellous aroma of tomatoes and garlic and baking fish filled the air as we stoked our appetites on meze and retsina. Finally it was uncovered and served, and it was the best fish I had ever tasted. Since then I have cooked psari plaki whenever a suitable fish presents itself. I sometimes do it with two smaller ones, and I usually add potatoes to the pan to make a complete meal. Scale, gut and clean the fish, leaving the head/s on. Salt and pepper well inside and out. Set it/them aside. Cook the onion in 2 tablespoons of olive oil over gentle heat for 5 minutes. Meanwhile plunge the tomatoes into boiling water for a minute to loosen the skins and then peel them. Chop two of them coarsely and add them to the onions along with the garlic and herbs. Cook the mixture gently for 5 minutes, then pour it into a pan large enough to hold the fish. Place the fish on top. Cut the remaining tomato into slices and lay them on top of the fish, alternating with slices of lemon. Cut the cooled, parboiled potatoes into fairly thin slices and lay them down each side of the pan. You’ll find the assembling of the dish easy to follow if you look at the picture. Finally sprinkle the remaining olive oil over the fish, tomatoes and potatoes. Cover the dish tightly with foil and bake it in a 350 degree oven for 35 to 45 minutes depending on the size of the fish. You should check it regularly after 30 minutes so you don’t overcook it. Insert a knife close to the bone to make sure the flesh is firm and the juices run clear.